The South African, and wider African, food system is undergoing a rapid transformation, with an associated transformation in nutrition. Both transformations are most advanced in cities where the food system is increasingly characterized by the presence of supermarkets and fast food outlets in malls selling highly processed foods. While local government has no clear formal mandate to address the food system, this paper argues that it is playing a profound role in reshaping the food system through non-food related planning and policy decisions designed to achieve urban development objectives. This paper uses a case study of the changing food system in Cape Town, South Africa, as an entry point to examine the urban planning agenda that is inadvertently generating a food system that undermines food security. The paper therefore presents a 20-year geography of supermarket expansion in the city and a discussion on the impact of developer-led urban development in the form of the shopping mall on the food system. The paper argues that the absence of concerted food system planning has negatively impacted food and nutrition security. 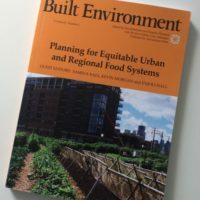 It concludes by suggesting that new opportunities for more inclusive urban food systems planning are being afforded by UN-Habitat’s New Urban Agenda and Sustainable Development Goals.